Well, I am hard at work at my Colette Patterns Anise Jacket. It is, by far, the most challenging thing I have ever attempted to make for myself. In fact, I am having massive “freak outs” at nearly every step but I am forcing myself to press onwards and just complete tasks without being too much of a perfectionist, as I think for this project its the only way I will get it finished/not be like a startled rabbit frozen in fear as the headlights approach. I am finding that the instructions are excellent, the pattern beautifully drafted and the Companion booklet with all the extra steps and illustrations worth every penny. The Colette website has a number of sewalong posts that have also been so helpful. Another reason why I love indi patterns so much – you just don’t get that kind of support from any of the Big4 pattern companies. I also tweeted a couple of questions about fabric selection and was completely thrilled to get an almost immediate helpful response!!! 1) Fabric Selection. I went with a wool melton from fabric.com in a lovely teal (much nicer than the photo’s below). 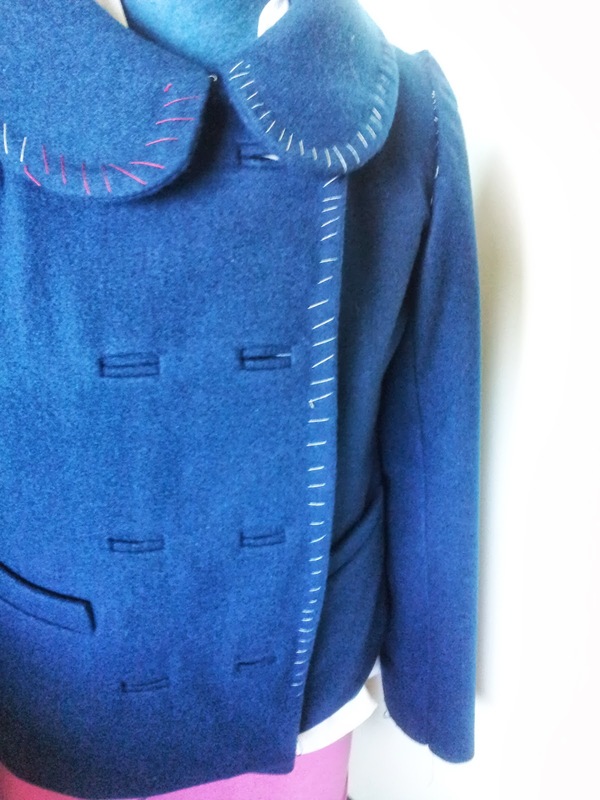 Colette Patterns told me that melton was great to work with for the jacket, provided it wasn’t too thick. Well. I think mine is a bit on the thick side. Its very heavy coat weight and its been quite difficult to work with. I ended up ditching the muslin underlining as it just made the coat so incredibly bulky. Lesson learnt: a medium weight fabric is best, not heavyweight. 2) Muslin and Sizing. I cut a size 2 in the shoulder and underarms and graded out to a 4 in the hips. I also did a small narrow shoulder adjustment and was very happy with the fit of my muslin. However, I did have to take quite small seam allowances (3/8″ or 1 cm) down the side seams and the sleeve seams as I think the thickness of the fabric resulted in a size down from turn of cloth. Another lesson learnt on fabric weight. 3) Bound buttonholes. These were a nightmare due to the extreme heaviness of the fabric. I butchered by first front attempting to make them the “traditional’ way before cutting a second front and using this fantastic tutorial from Lena at the Sewing Space. I still didn’t do a great job – I ended up sewing late at night, with the flu, which I really don’t recommend for precision sewing. I should have gone to bed but I just pushed myself to get it done. Well, they are done. They are acceptable but a little too wide and not perfectly even. Acceptable though for my FIRST EVER BOUND BUTTONHOLES!!! Did I say EVER!! The next time I make them they will be perfect but for this coat and the fact that the more uneven ones will be covered by a button I decided to push aside my normal quest for perfection and say to self “good enough, done, next step”. Otherwise I think I will be so intimidated by this process that I will never finish (vision of startled rabbit popping into head again). Sleeves basted in. This photo is more like the actual colour, taken in daylight. Just before sleeves set in. Taken at night so fabric looks really weird. 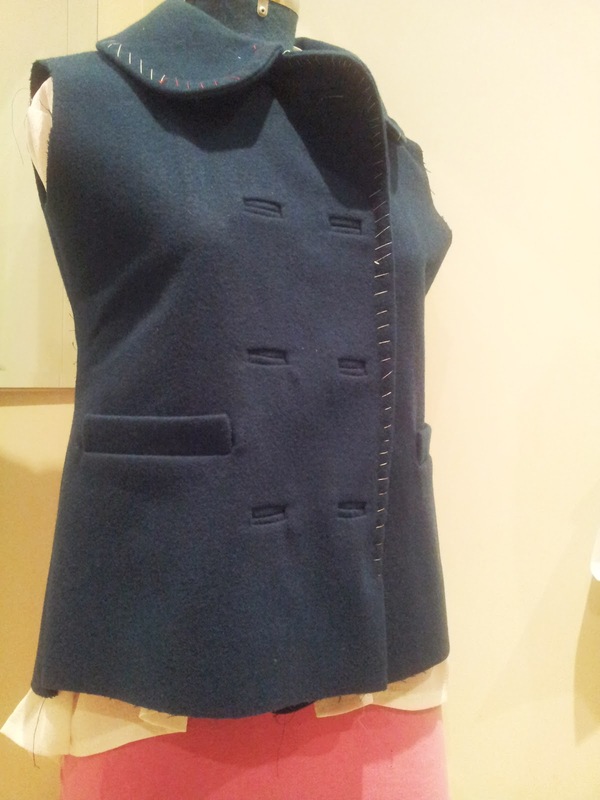 4) Welt pockets. I am much happier with the welt pockets. I did have to refer to the Colette tutorial on Welt Pockets for clarity and was seriously freaked out about making them but I just followed the instructions, and they turned out great. Beautiful in fact. 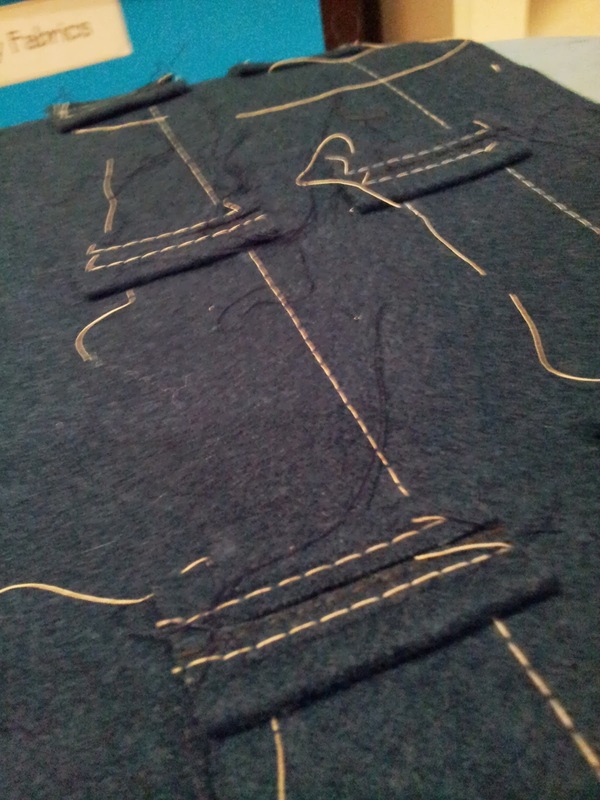 Sewing whilst not massively exhausted and sick was also helpful. So as of tonight I have done the diagonal basting and sewn up the side seams. I have sewn the sleeves and just need to set them in and its looking great. It is looking a little short though so I think I will do a hem facing so I don’t lose too much of the length as I didn’t realise the pattern needs a 2″ hem. Wince, those buttonholes. Tempted to try and tidy them up a bit, but I’ll take good advice and refrain.